TEDxJohannesburg has revealed a rich and diverse line up of speakers for their next event, taking place on Friday 30 November 2018, at the soon to be reopened Vodacom World, in Midrand. The theme for this, their flagship event, is Decoding Greatness. The intent is to celebrate Nelson Mandela – and others like him – in his centenary year. This event, presented in the famous TED format of powerful, multiple, single-minded talks, each three minutes to eighteen minutes in length, is hosted with the support of Global Citizen Festival, and brought to you by Vodacom World. The partnership with Global Citizen is a continent wide search for innovative young minds with ideas that could contribute to solving the world’s biggest challenges, as defined by the United Nations Sustainable Development Goals. Those selected will form the cohort for TEDxJohannesburg’s 2019 activation – an online mentorship programme running from January to December 2019, aptly titled 100Ideas100Millenials. This is a particularly strong TEDxJohannesburg lineup. And what’s more, the organisers are expecting a few more exciting confirmations in the days ahead. 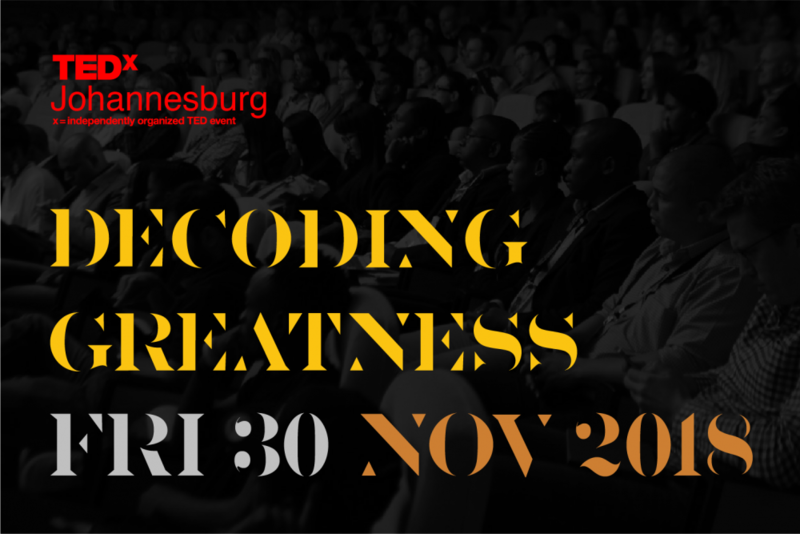 Get your ticket viahttp://tedxjohannesburg.co.za/decodinggreatness.html, or simply search for TEDxJohannesburg on https://www.quicket.co.za/. A standard ticket costs R1500, with the early bird price set at R1200. Students and NGOs get special discounted rates. Seats are limited.